Second chance! You can still give the gift of racing with that race set or get the set you really wanted…and at a special limited-time price: 20-percent discount on the 20 top sets for just 20 days. All of the quantities are very limited so order yours now. The AF Corse Team is sure to be up front in the Carrera championship. They’ll be facing a stiff challenge from the updated version of the Chevrolet Corvette C7.R that has already won the famous long distance race seven times in a row. This model was introduced in 2014 in Detroit and is more aerodynamic and has a stiffer chassis. All the experts see it at the front of the pack. However, the Ferrari 458 Italia GT2 is famous for its mastery in the bends. Both produce a wonderfully musical 8-cylinder sound. 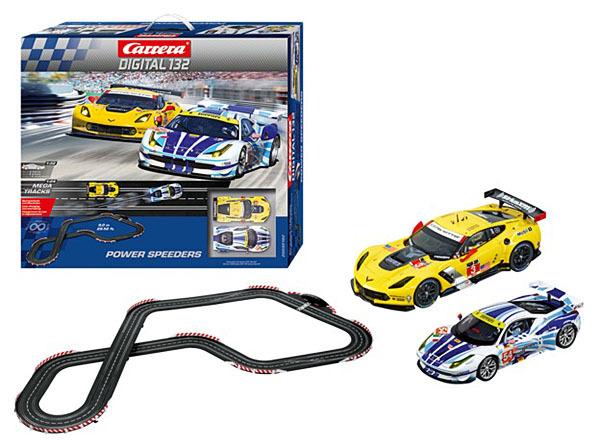 Can the Corvette retain its titles or will it be beaten to pole position and championship glory by the eager Ferrari team around this 25.9-foot racetrack? It’s easy to imagine the indefatigable burning desire of the drivers as they head off to the Su¨dkurve after a 300 km/h sprint down the straight. 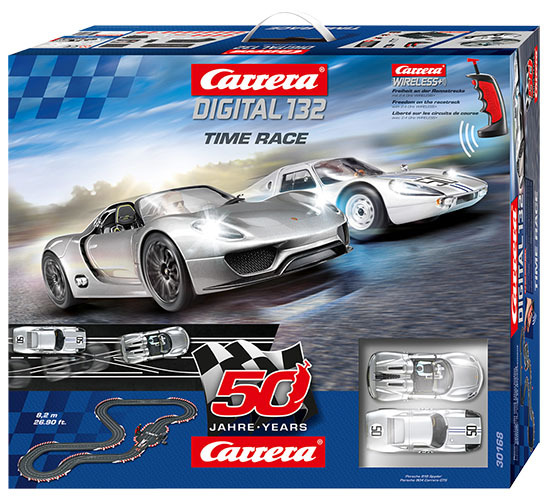 We are advised by Carrera that this car will only be available in this race set. 1. Use a hand-held control set extension box #30348. This is plugged into the socket of hand-held control set 1 and extended on to control sets 1, 3, 4 in the extension box and hand-held control sets 2, 5, 6 in the Black Box. 2. Wireless: Connected up to Black Box Tower 1 and/or 2, to enable cars 1 to 4 to be controlled by wireless. Black Box sockets 3 and 4 are for handset controls for cars 5 and 6. A maximum of 4 cars can be controlled by wireless. The other two have to be plug-in controllers. 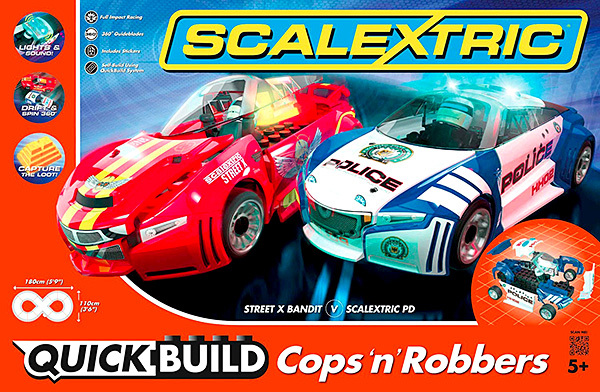 Welcome to the exciting world of Scalextric Digital. 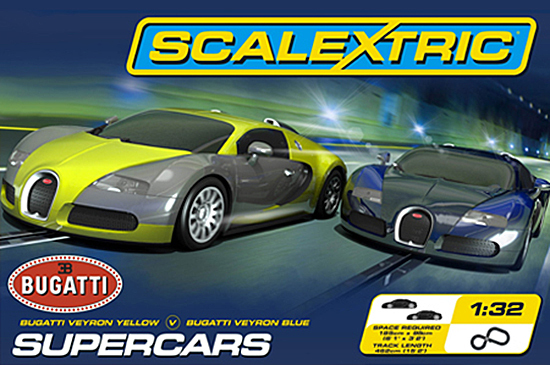 This set allows you to race up to four cars at the same time (two cars are provided), performing amazing, realistic overtaking and braking manoeuvres. You can switch lanes at the touch of a button to overtake or block your opponent. 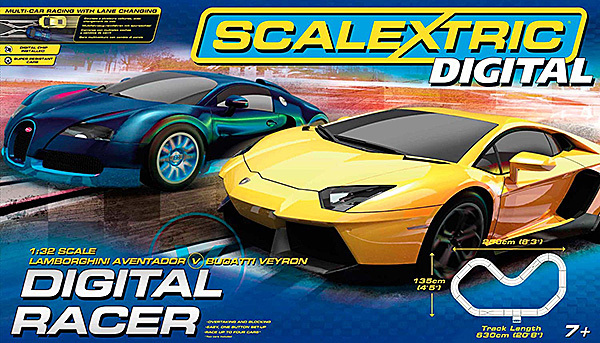 This set includes everything you need to get started with Scalextric Digital – it features a large circuit and comes supplied with two Digital Chip installed cars. Additional digital cars are available or you can easily convert most standard cars to run on digital layouts. The super resistant Lamborghini Aventador and Bugatti Veyton racers feature easy change pick-ups and the Magnatraction™ system to help them stay on the circuit. 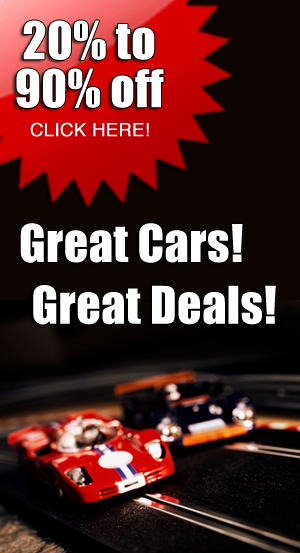 Want to race a third or fourth car? 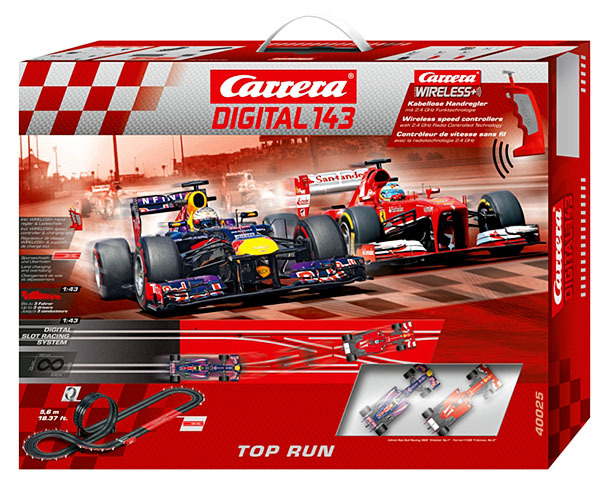 To race a third car, all you will need is 10111 2.4GHz Wireless+ Speed controller and your choice of any of the D124 cars. If you want to be able to charge two controllers at a time you will also need a 10110 recharging base. You can run up to four D124 cars with Wireless+ controllers from any recharging base. If you are going to race more than three cars at a time you will need a 10111 controller for each additional car. 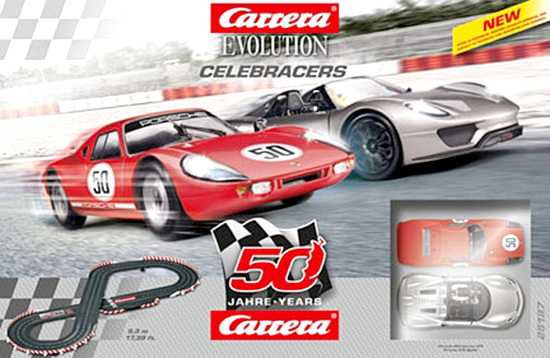 Carrera also offers the 30369 Bluetooth Adapter to use Carrera’s free app and wireless connection between your smartphone or tablet and the 30352 Carrera Control Unit to display lap counting, timing, race management and other race features on your smartphone or tablet. 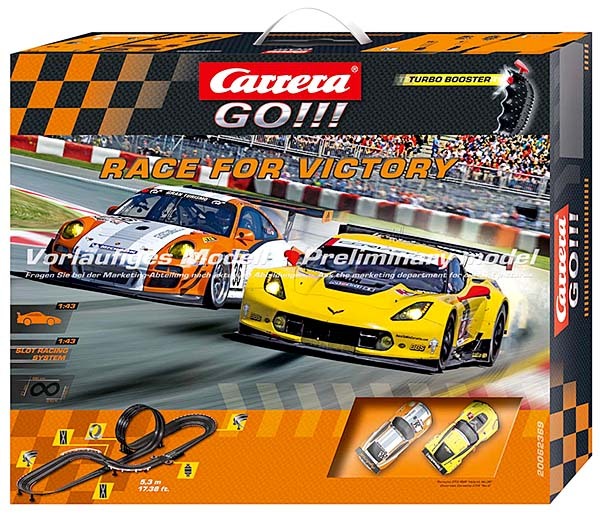 1/43 scale analog race set complete with track, cars, power supply and controllers — everything you need to begin racing is in the box.. Carrera GO! 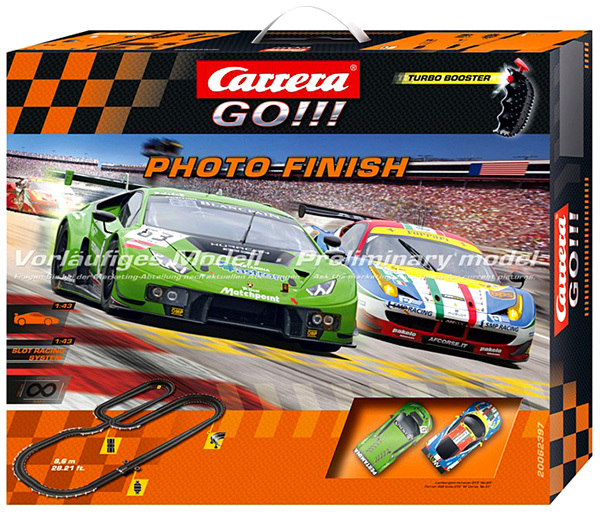 sets are great race sets for children and an affordable start in the slot car racing hobby. 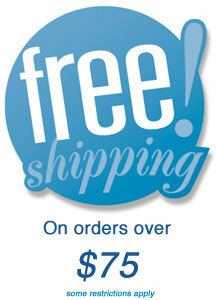 They are ideal for use where the available space for a layout is limited. The compact 1/43 scale allows more of a layout within a given area. The Porsche GT3 and the Chevrolet Corvette are both hungry for victory. The Carrera GO!!! 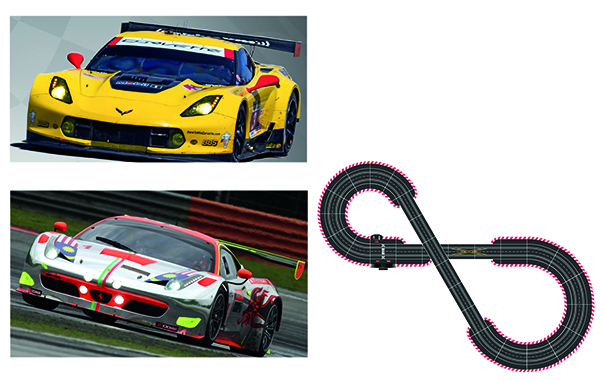 ‘Race for Victory’ set includes a 17.4-foot Carrera racing circuit that truly lays down the gauntlet. Keep the pedal to the metal on the fly-over and race up the steep bend and into the loop. Every grain of horsepower is transformed into speed. The Carrera GO!!! ‘Race for Victory’ set is all about speed. However, skilful driving will not be enough on its own; when racing cars of this calibre meet you’ll need an absolute will to win. Who can ride so much horsepower to victory? Grab the controllers and see for yourself! 6.0 x 2.3-feet, 17.7-foot lap length. 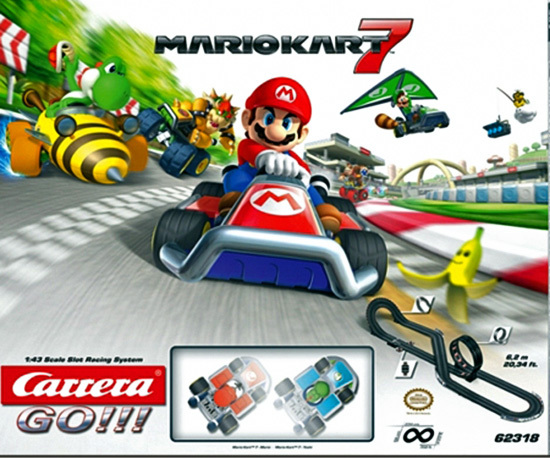 Mario burst back onto the scene at full speed. Now with even more superpowers, Mario speeds from one adventure to the next. Together with his buddy, Toad, the world’s best-known plumber causes havoc out on this Carrera racetrack. It’s time to race! Toad is the adventurous type and loves putting his foot to the floor. Great road-holding with wide-based tyres makes racing even more fun. Into the bend, then hit top speed around the loop! Mamma mia! The clever track layout guarantees thrills and spills every lap. There are great details from Mario’s world up and down the 17.7-foot race track to excite fans of all ages. 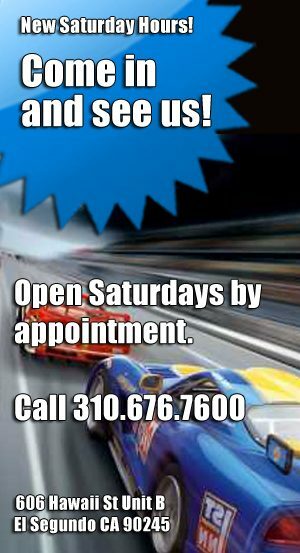 Racing fun for the whole family. transformer, connection track, 2 speed controller, lap counter,straights, curves, high banked curves, Chicane, junction, guardrails, supports. 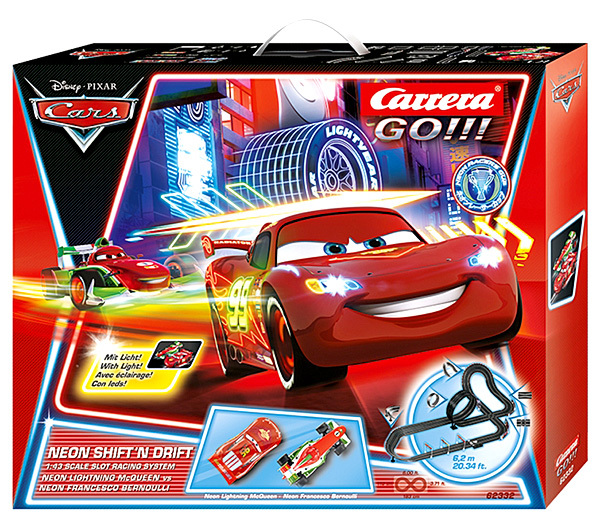 Lightning McQueen and Francesco Bernoulli put the pedal to the metal with the Carrera GO!!! 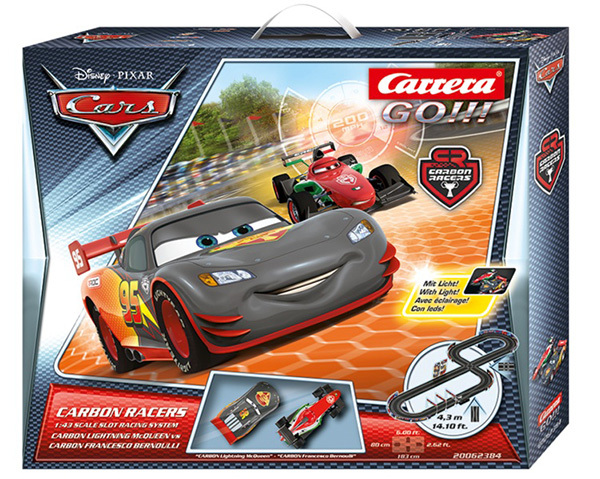 ‘Disney/Pixar Carbon Racers’ set! These two Disney/Pixar Cars heroes in their new carbon-look outfits go head-to-head once again on this 14.1-foot racetrack. But watch out! The narrow section and junction add an extra tactical challenge to each race. Crashes can’t be ruled out as neither of these drivers is prepared to give way! The Carrera GO!!! 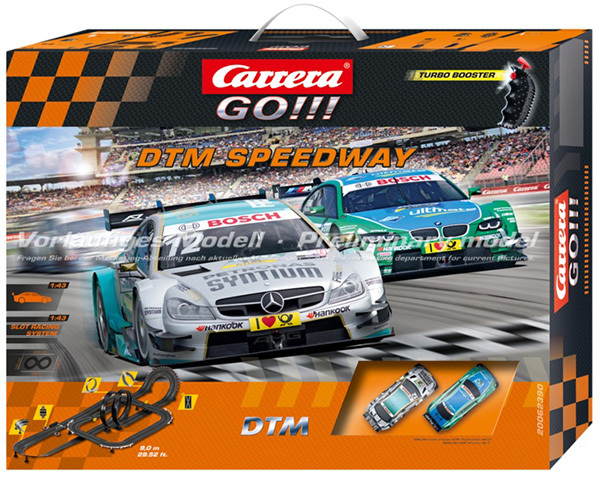 DTM Speedway’ 1/43 scale set puts the spotlight on two impressive, versatile slotcars: the BMW M3 DTM “A.Farfus” and the AMG Mercedes C-Coupe DTM “D.Juncadella”. The loop, fly-over and high bends guarantee excitement for even the most experienced DTM drivers around the 29.5-foot Carrera GO!!! circuit. Challenge accepted! 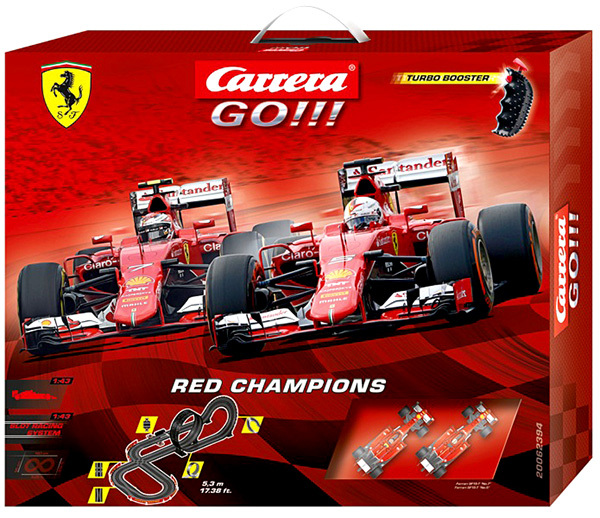 Two famous racing drivers in two powerful red racers on a highly challenging 1/43 scale motor racing circuit – that’s the Carrera GO!!! ‘Red Champions’ set. The Ferrari SF15-T “S.Vettel, No.5” and the Ferrari SF15-T “K.Raikkonen, No.7” are sure to raise the pulses of Ferrari fans everywhere! A narrow section, fly-over, a loop and a junction all require nerves of steel, but with so much power under the bonnet the two Formula 1 stars master the 17.38 ft. Carrera GO!!! circuit with ease. The race starts and both cars pull away with high speed! This is going to be a real head-to-head race. The Carrera GO!!! 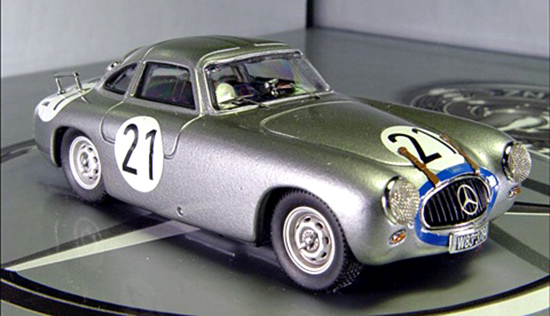 “Photo Finish” 1/43 scale set provides two powerful sports cars from Italy. Lamborghini Huracán and Ferrari 458 Italia GT2 are hot rivals on the track in real life and now on the 28.2-foot high speed slot track of this set. The results? Too close to call, we must go to the photos to check who has prevailed! Quick Build Cops ‘n’ Robbers Set. Build, Race and Destroy! Enjoy full impact racing with these extreme drift and slide cars. Features ‘QUICK BUILD’ clip-together cars which break away on impact. Customise your car with clip-on wheels, decal sheets and mix and match parts. The figure of eight track includes borders. The Police car features flashing roof and siren. Robber’s car has feature light. 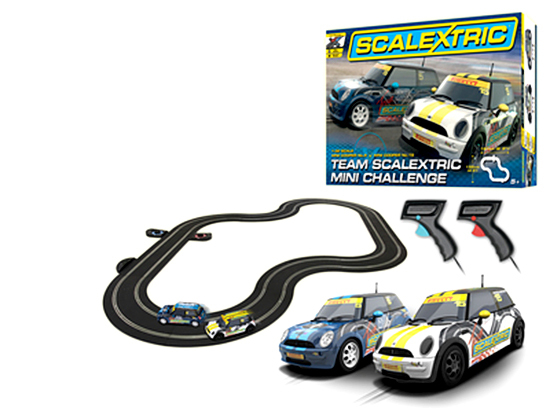 The two Team Scalextric Mini Challenge racers go head-to-head in this set. Build four different layouts with the track supplied. 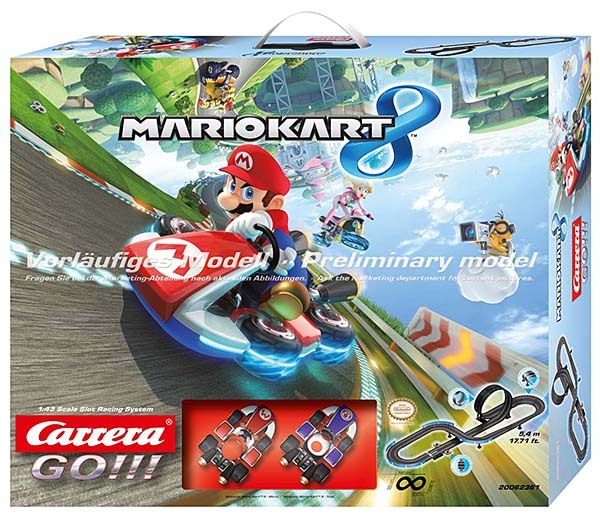 This set includes a lap counter for even more excitement. The Super Resistant MINI Coopers are tough enough for full impact racing. Each hand controller has a two-position selector switch which allows the driver to choose slow or fast speed settings to reflect the driver’s experience. 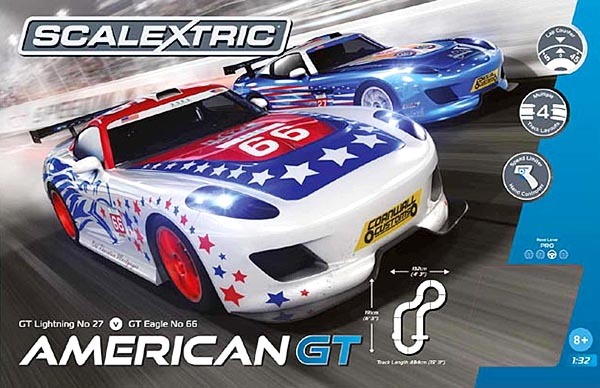 C1361T American GT set with two generic GT cars (one red, one blue) with stickers for American markings. 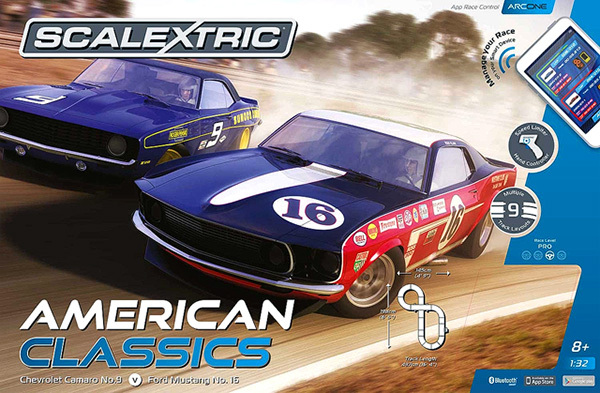 C1362T American Classics Set ( #9 Sunoco Camaro and the 1969 Red/black/white Trans-Am Mustang (ARC ONE App set) Analogue set with wired controllers. Our after Christmas present to you is the special purchase on two of the best of Slot.it LeMans cars, the Ford GT40, including the winner of the 1966 race. 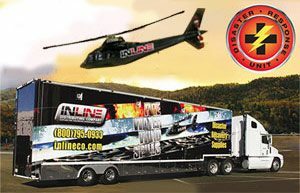 1/32 scale slot car, ready to run on all 1/32 scale slot car tracks. Ford MkII #6, LeMans 1966. 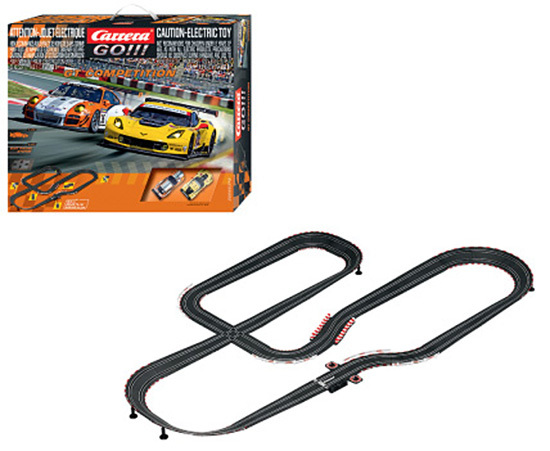 WAS $74.99 1/32 scale slot car, ready to run on all 1/32 scale slot car tracks. 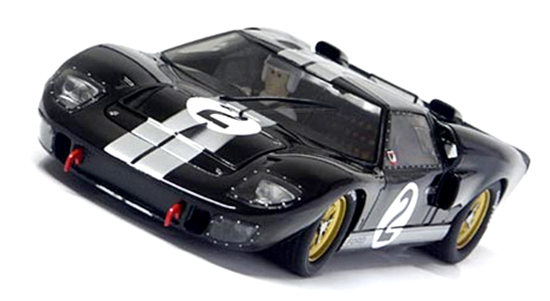 1966 LeMans winning #2 Ford GT40 MkII driven by Chris Amon and Bruce McLaren in the infamous Ford “photo finish” that cost Ken Miles a sweep of the year’s 3 top endurance races, Daytona, Sebring, and LeMans. The early versions of the 1972 Lotus 72 carried the dramatic John Player Special black and gold like this the car that ‘Emmo drove at Monaco in 1972 and Slot.it replica is here now. 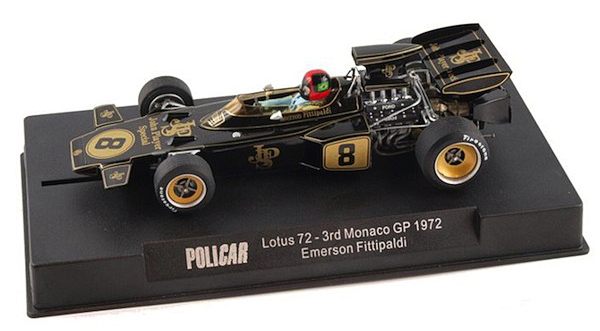 PCAR02C Lotus 72 n.8 Monaco 172, driver Emerson Fittipaldi. The Racer Group 5 BMW is finally on its way but there are a limited number of them so place your pre-order now. Racer SW43 BMW 320 Group 5, Rodenstock Wurth, Zandvoort DRM 1979—PRE-ORDER NOW! Racer SW43 BMW 320 Group 5, Rodenstock Wurth Team, Zandvoort DRM 1979, Div. II winner, driver M. Winkelhock. The brilliant orange March 761 from the 1976 Grand Prix season is coming soon from the Slotwings division of Fly so you can place yours on pre-order. Fly W045-2 March 761, 1976 Italian GP, driver Vittorio Bramabilla—PRE-ORDER NOW! Mercedes-Benz won Le Mans in 1952 with the prototype for the 300SL ‘Gullwing’ that was to be produced two years later. The 300SL coupes finished first and second and they are coming in early 2017 as hand-made cast-resin ready-to-race replicas from MMK. The quantities will be limited so pre-order yours now. MMK78A Mercedes-Benz 300SL no. 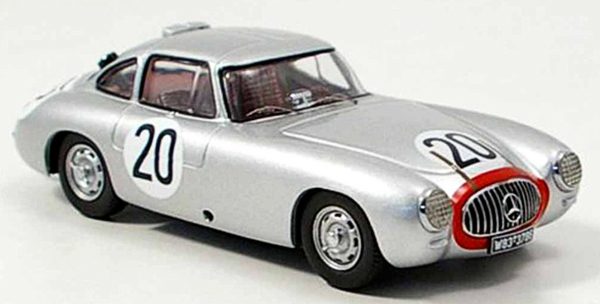 21 winner Le Mans 1952—PRE-ORDER NOW! MMK78A Mercedes-Benz 300SL no. 21 winner Le Mans 1952, drivers Hermann Lang and Fritz Riess. MMK78B Mercedes-Benz 300SL no. 20 second at Le Mans 1952—PRE-ORDER NOW! MMK78B Mercedes-Benz 300SL no. 20 second at Le Mans 1952, drivers Theo Helfrish and Nerbert Niedermayer.